Every time we think we have galactic dynamics figured out, the universe throws a new curveball at us. In a new image, two galaxies consumed a conspicuously-absent third. Galactic cannibalism is nothing new, but its chilling impact on star formation is. In the constellation Leo, 49 million light years away, galaxies NGC 3226 and NGC 3227 are glowing in the rush of consuming a now-absent third galaxy. But the surge of warm gas doesn't seem to be sitting well with NGC 3226: the influx of warm gas appears to be disrupting star formation by messing with the cool gas key to stellar nurseries. 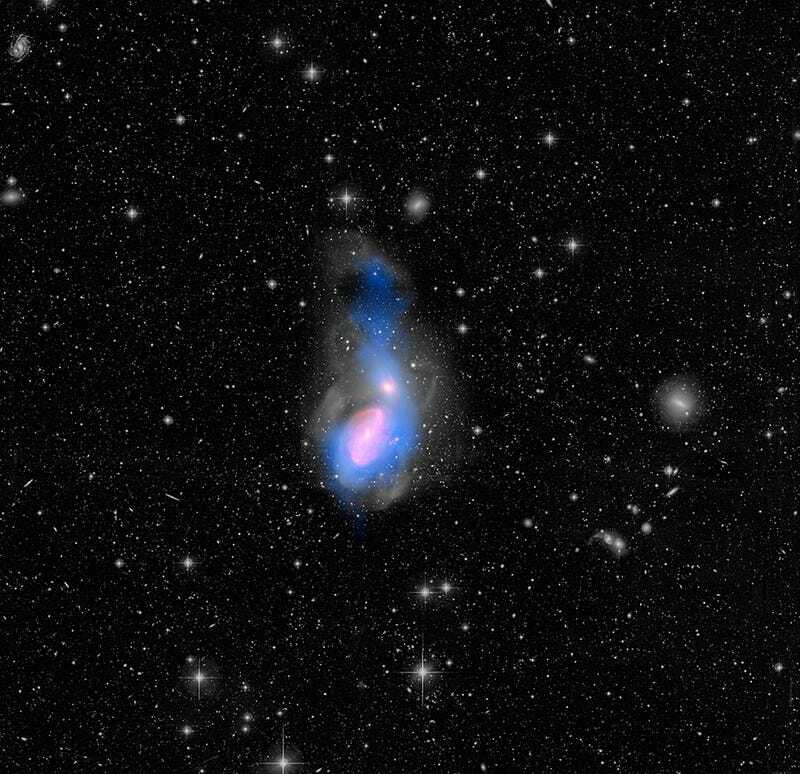 Adding material to galaxies often rejuvenates them, triggering new rounds of star birth as gas and dust gel together. Yet data from the three telescopes all indicate that NGC 3226 has a very low rate of star formation. In this instance, material falling into NGC 3226 is heating up as it collides with other galactic gas and dust, quenching star formation instead of fueling it. As this warm gas chills out in the future, though, NGC 3226 should get a second wind in its stalled-out production of new stars. The image is a composite of multiple wavelengths. Greyscale is optical starlight (550 to 700 nanometers), revealing stars flung into great loops by the gravitational dance of colliding galaxies. Blue is radio wavelengths (21 centimeters) of cool hydrogen gas from the consumed galaxy putting a damper on star formation, with a large plume being pulled in by the gravity of NGC 3226. Red is infrared emissions (8 microns) of warm gas and dust, a small spear at the tip of material from the cannibalized galaxy feeding a disc in the core of NGC 3226, and more extensive features within NGC 3227. Not pictured are observations from Herschel which were critical in modelling work on star formation within the galaxies, confirming that NGC 3226 isn't doing much of anything except munching on cold gas.